The director of the Russian State Tretyakov Gallery Zelfira Tregulova. The director of the Russian State Tretyakov Gallery says cultural ties should be strengthened when political and economic relations are weak. 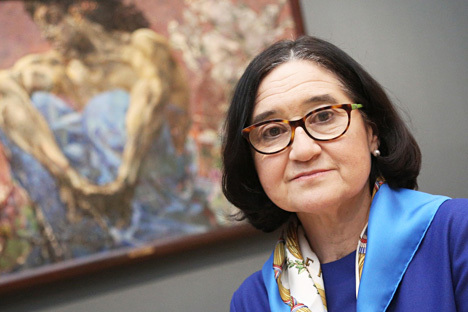 Economic sanctions are no barrier to cultural exchange among countries and exhibition organizers, Zelfira Tregulova, head of Moscow's State Treryakov gallery, has told RIA Novosti. “Sanctions are no hindrance, moreover, we understand how important our mission is today, I think even more important than it was before,” Tregulova said. However, sanctions have impacted the amount of money available for cultural exchange, Tregulova says. Russian companies that supported our international projects can no longer do so for various reasons, including sanctions," she said. "We understand that we have to keep up cultural ties - that we need to consolidate our forces - when economic and political contacts are weak and complicated." In March 2016 an exhibition of portraits of the Russian elite will be hosted at London's National Portrait Gallery. "In April we will also open a fascinating exhibition of collections from the National Portrait Gallery in our museum. It will be called ‘From Elizabeth to Victoria’ and will show 49 paintings of the best British masters from the times of Elizabeth Tudor to the Queen Victoria,” Tregulova said. Next autumn the Tretyakov gallery plans an exhibition from the Vatican museums. “It will be a brilliant show of 40 paintings, including ‘Pieta’ by Giovanni Bellini, two small works by Rafael, ‘The Entombment of Christ’ by Caravaggio, works of Guercino, Guido Reni, Correggio and Nicolas Poussin. In exchange the Tretyakov gallery will bring its ‘Biblical themes in Russian art’ of the 19th – early 20th centuries,” she added.